Lakemoor gardener hires lawyer to fight ordinance - KRV Legal, Inc.
LAKEMOOR – A Lakemoor woman is prepared to defend her potty planters in court if the village fines her under a nuisance ordinance. 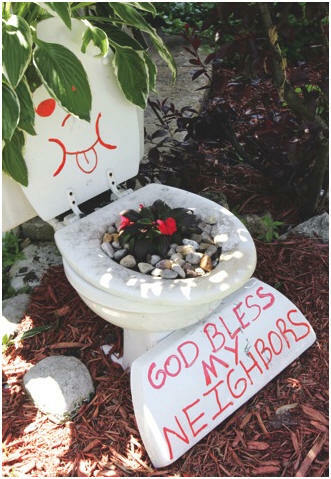 On May 29, the village gave Tina Asmus 30 days to clear out two old toilets that she used as flower pots near her front porch before citing her under the “Public Nuisances Affecting Peace and Safety” ordinance. Asmus hired an attorney last week, but village leaders said Monday that they didn’t plan to back down. Village President Todd Weihofen said the warning was among more than 100 sent out as part of a larger effort to improve the village’s image. Other warnings involved junk vehicles and boats left in yards and tall grass. But if Asmus’ toilet planters are displayed at 134 S. Highland Drive come June 29, she’ll be ticketed between $25 and $500. Asmus said she had no plans to change what she considered artwork, and her attorney, George Kililis, said they planned to challenge the ordinance’s constitutionality because it was vague and too broad. If such a challenge is successful, Weihofen said the village would write and pass another ordinance.